Posted Tuesday, September 3rd, 2013 by Steve Leigh. If you’ve used a color printer or programs like Photoshop, you’ve probably seen or heard the term CMYK, but what does it stand for? Why should you care? In this article, we’ll explore the CMYK color model, as well as how it differs from other color models like RGB. CMYK is a “color model”, which is another way of saying it is a method for creating a variety of different colors. The first three letters stand for cyan, magenta, and yellow. 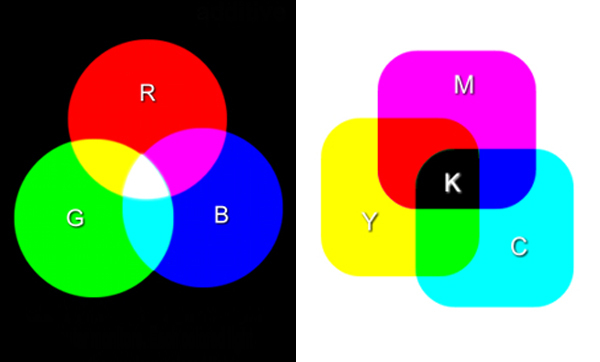 The last letter represents black, but the “K” actually stands for “key” or “key plate”, since black is used as a key to which the other colors are calibrated. 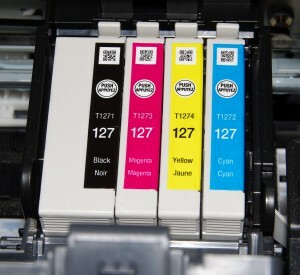 By combining these four colors (cyan, magenta, yellow, and black) a printer can create millions of colors on a page. By layering microscopic dots of these four colors in different ratios, the overall effect can look like multiple solid colors at a viewing distance. For example, combining several dots of cyan with several of yellow will create green on a page. Remember when your sister broke the green crayon and you had to combine yellow and blue to get green instead? The same concept applies here, with a lot less crying. See our article on Understanding Printer Resolution to learn how smaller dots generally equal sharper images. Have you ever printed a photo from your computer and found that the result was very different on the page than what you were seeing on the screen? This is a common occurrence, since displays use a different color model than the CMYK model. A comparison of RGB (left) and CMYK (right). Computer monitors and many other displays use an “additive” color model. They use a combination of tiny red, green, and blue lights that change white light into colored light. In this model, white is the combination of all of the primary colors, and black is the absence of any light. In a “subtractive” color model like CMYK printing, however, you start with a white piece of paper, so white is the absence of any color. Black, on the other hand, can be a combination of all colors. Since black ink is included in the system, however, it is often used for true black, rather than a combination of cyan, magenta, and yellow. The differences between the two models can cause some color inaccuracies, but most modern software does a good job of making the translation. Professional applications like Adobe Photoshop allow users to choose “color profiles” such as RGB and CMYK to try to more accurately represent on the screen what will show in the final print, but the average user need not worry about it too much. If you have an inkjet printer with only one color cartridge and one black cartridge, you might be tempted to think this is not CMYK printing. For example, the set of Canon MP230 ink cartridges includes one color and one black supply. In fact, contained within the “tricolor” cartridge are the cyan, magenta, and yellow inks. The benefit of this is that the cartridges are easier to replace, but the downside is that if one color runs empty, you have to replace all three at once. 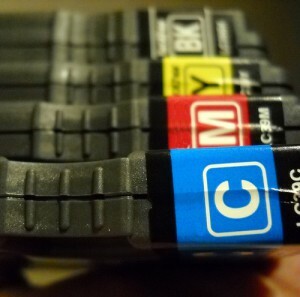 The majority of modern color inkjet printers use a combination of four or more cartridges. One each of cyan, magenta, yellow, and black. In some cases, printer manufacturers supplement these with extra supplies such as “pigment black” for deeper blacks, or extra colors such as light magenta or light cyan in the case of Photosmart 8230 ink cartridges. These can offer a wider color gamut, smoother color gradients, and overall better results. The CMYK color model is a robust system that is used in almost every piece of color print media you see around you, and now you have a better understanding of how the process works. For the most part, however, you can simply let your software and your printer do the work, and let the CMYK system create beautiful color images for you with no fuss! Did you find this article informative? Did we miss an important detail? Let us know about it in the comments below. Steven Leigh has been enthusiastic about technology since he was very young, and he enjoys sharing his knowledge and expertise with others, through his writing. He is also a composer, a musician, and a singer, experimenting with the blending of technology and music with his recording and performance projects. In his free time, he enjoys playing golf and running in 5K races and is currently training for his first 10K.